Once you’ve made your intro, you can take the skills you’ve learned to produce awesome, unique-looking custom intros for all of your business videos. Ready to make a gorgeous, knock-em-dead intro? Let’s go! If you don’t already have them for your Mac, you’ll need to pony up and buy them from the App Store. Keynote is about 20 bucks and iMovie is about 15 (US dollars). The Google fonts that I use in this tutorial are Philosopher and Muli. You can download them from Google, and they’re also included in the download that goes with this tutorial. There are tons of great places to get free images that you can use for your intro. For this tutorial, I used this leaves image from Pixabay. Download the highest-resolution image you can and save it somewhere on your Mac. Again, you’ll find this file in the tutorial download. For more impact, you’ll want to set your intro to some music. There’s plenty of royalty-free music out there — some free, some paid. For this tutorial I used Jazzy Frenchy from Bensound. Another great place is Music for Makers, which sends you one free music track each week (you don’t even need to include a credit!). Download your track and save it to your Mac. 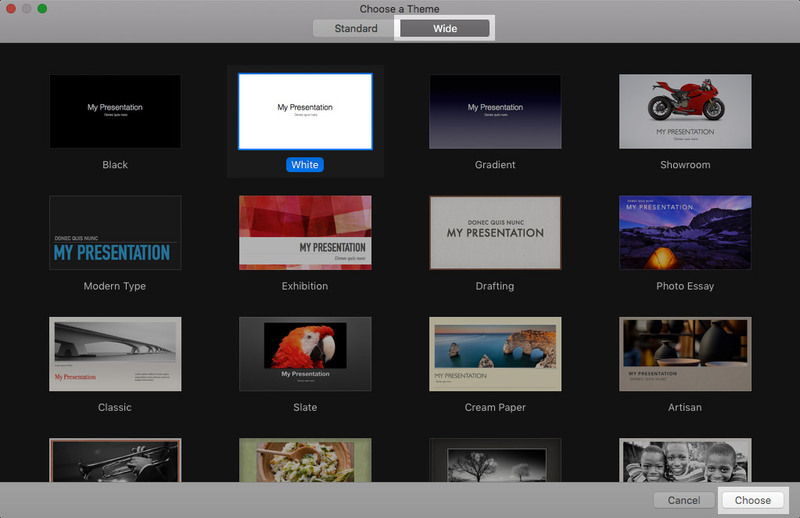 Fire up the Keynote app on your Mac. 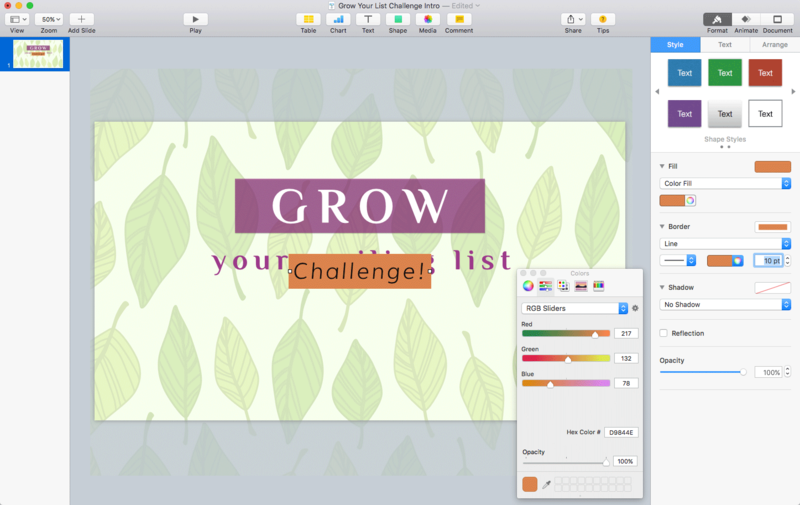 Create a new Keynote presentation. 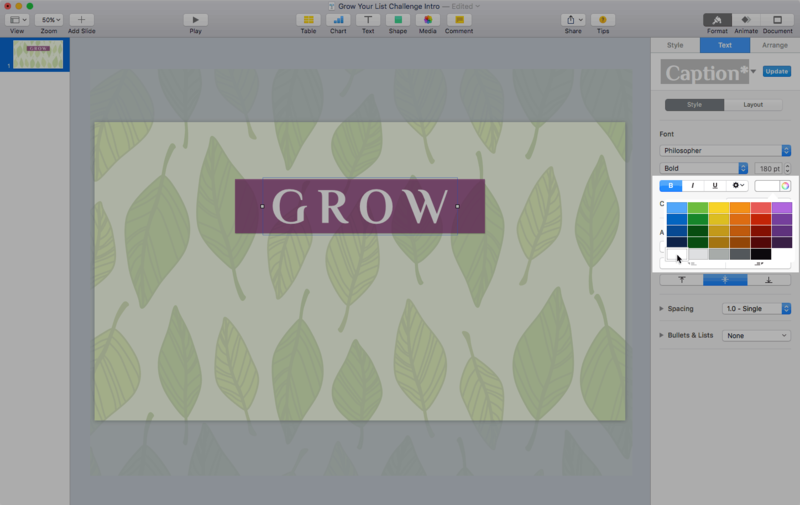 When creating your intro presentation in Keynote, choose the Wide White theme. Delete the two default text boxes by clicking them and pressing Delete. Looking good! Now save your new Keynote file by choosing File > Save. Give the file a name, such as “Video Intro”, and click Save. It’s a good idea to keep saving your file as you work through the steps in this tutorial to make sure you don’t lose anything! Just choose File > Save every time you want to save your changes. Now you have a shiny new Keynote document, it’s time to add some stuff to it! 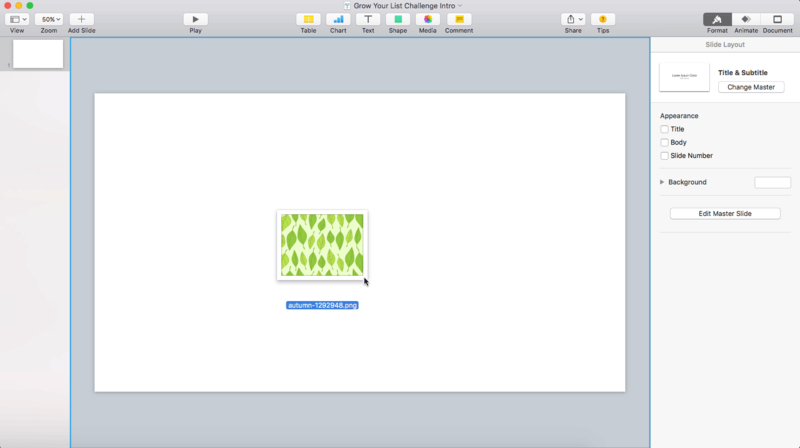 To add the background image to your presentation, drag it from the Finder into the Keynote window. Resize the image to fill the whole frame. 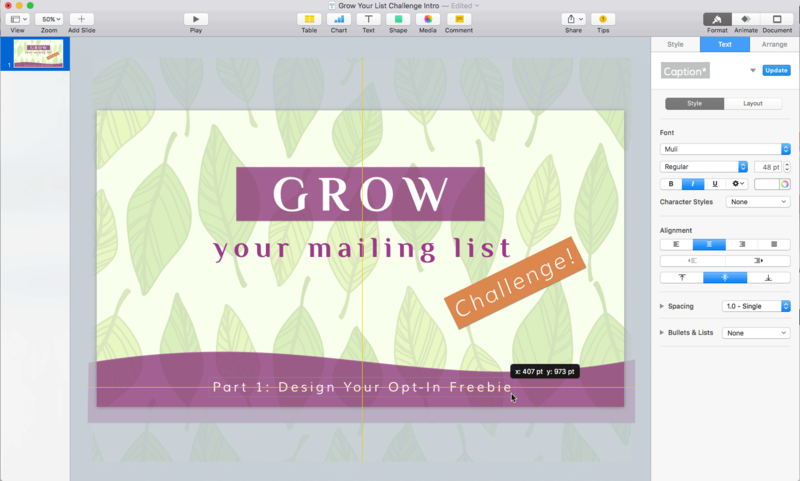 Position and resize the background image so it fills the whole slide. To fade out the background image, set its Opacity to 30%. Now let’s add the big “GROW” text at the top of the video. We’ll also add that see-through purple rectangle for the text to sit on. 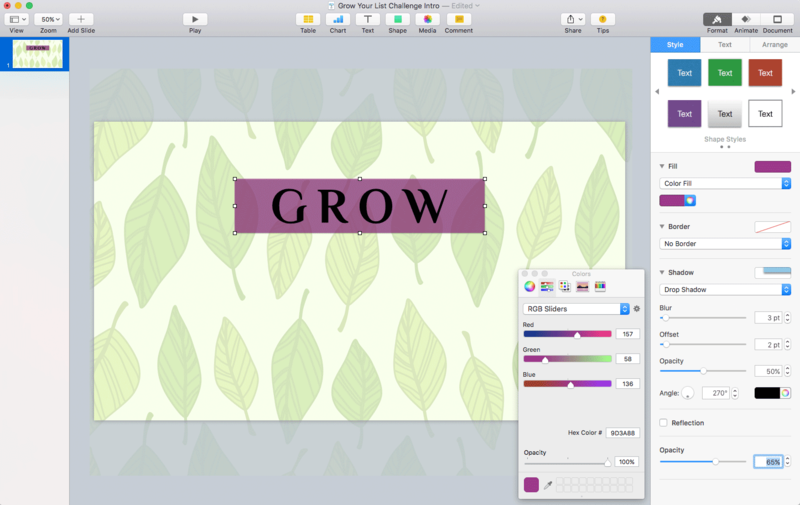 Insert a new text box with the word “GROW”. 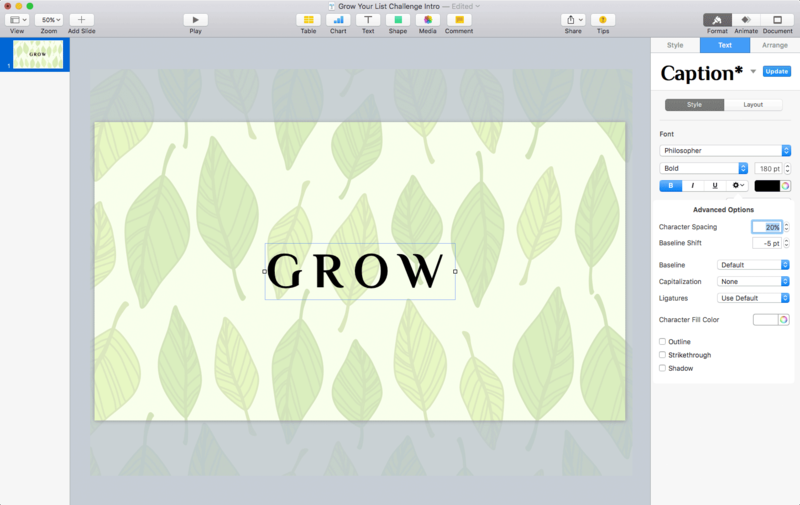 Use the Text tab in the Format panel to style your “GROW” text. 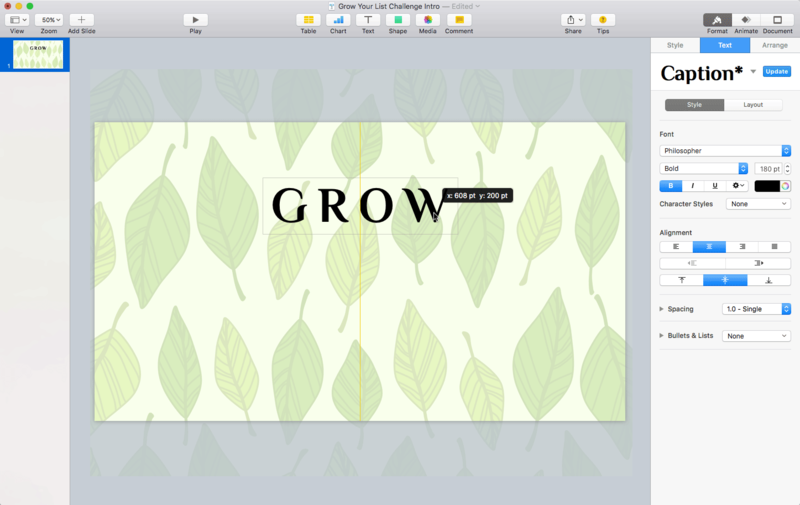 Positioning the “GROW” text box. Use the yellow guide to centre the box horizontally. 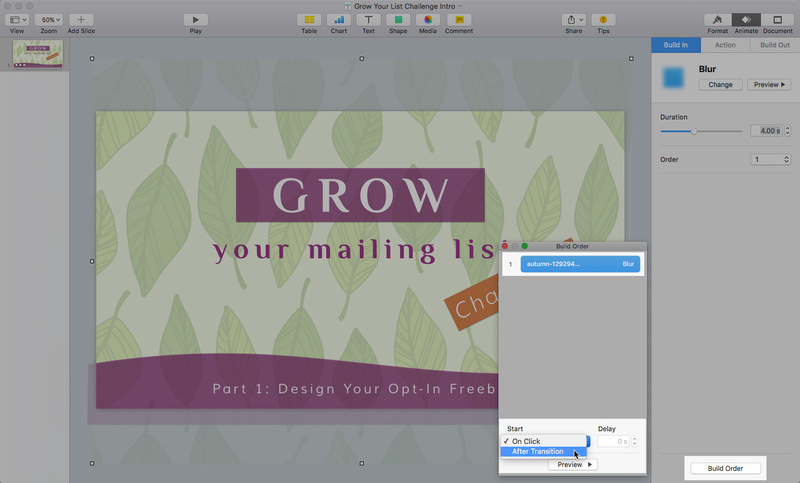 You can use Keynote’s guides to align the box horizontally. First drag one of the text box’s resize handles (the little squares) left and right a bit; this forces Keynote to centre the text horizontally within the box. Now drag the whole box left and right until you see a vertical yellow guide line appear, then let go of the mouse button; this snaps the box to the horizontal centre of the slide. 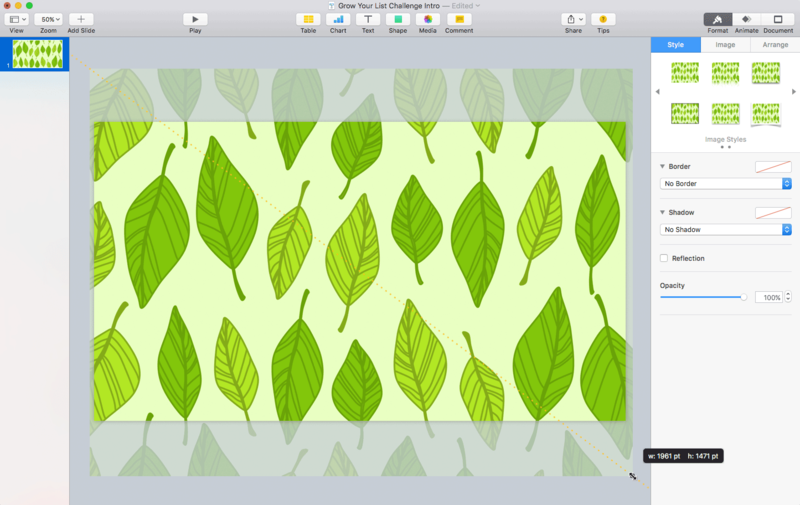 Add a rectangle to the slide and choose Arrange > Send Backward to move it back a layer. Position and resize the rectangle. 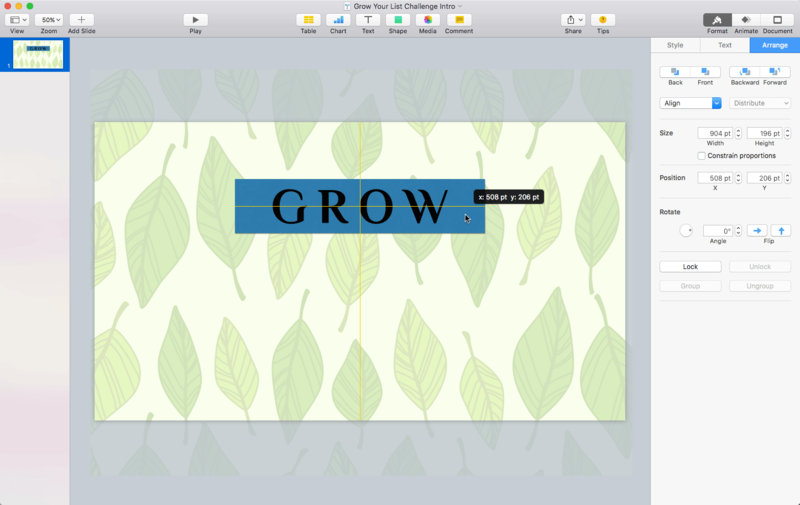 Resize the rectangle, then drag it until it’s centred directly underneath the “GROW” text. 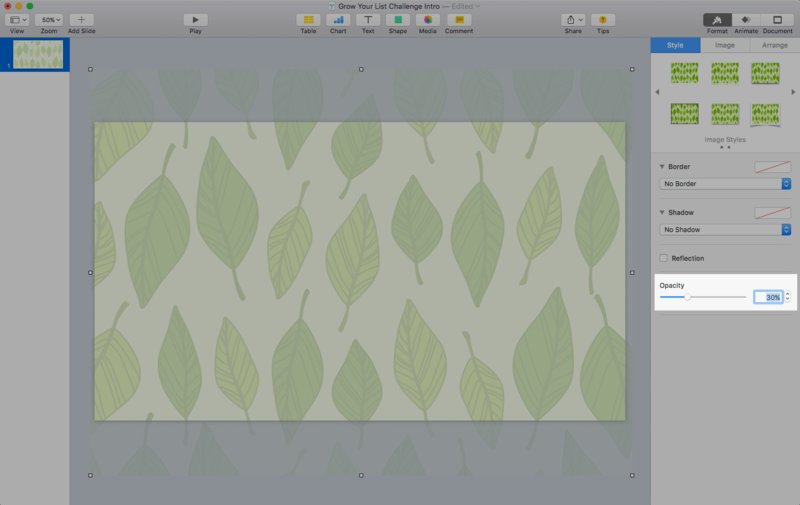 Style your rectangle by setting its colour and opacity. Click the white box to turn the text white. Choose Insert > Text Box again. Click the text box and type the text that you want to use (your mailing list). Press Command-Return to finish. Drag the text box until it’s just about in the middle of the frame. Use the yellow guides to align it horizontally with the centre of the frame. 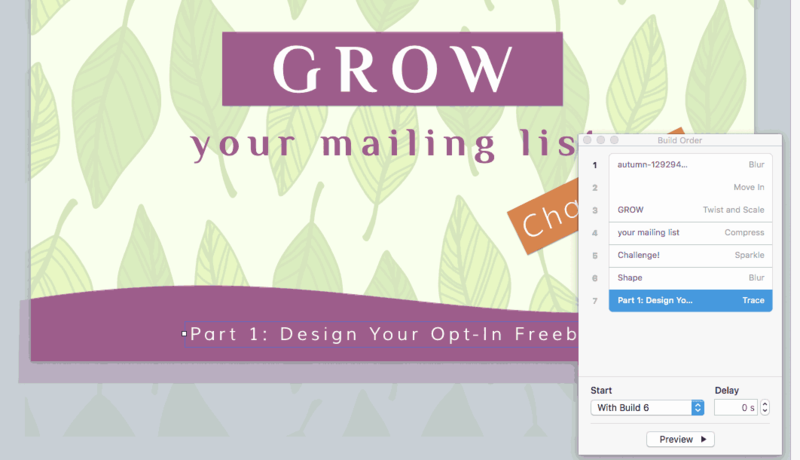 Adding the “your mailing list” text box. Hey, you’re off to a great start! So far our text has all been horizontal. Let’s spice things up a bit for the “Challenge!” text by rotating it so that it stands out. We’ll also use the Muli font for contrast, and add an orange background. Choose Insert > Text Box. Click the text box and type Challenge!. Press Command-Return to finish. In the Format panel, click the Text tab to bring up the text options panel. Choose the Muli font, and click the I button to make it italic. Set its character spacing to 10%, and its font size to 80 pt. In the Format panel, click the Style tab to bring up the style options panel. In the Fill section, click the menu and change No Fill to Color Fill. Click the rainbow icon below the menu and pick an orange colour (I used the hex value #D9844E, or RGB 217, 132, 78). Adding a thick border to a text box is a nice trick if you want to make the box’s background larger. 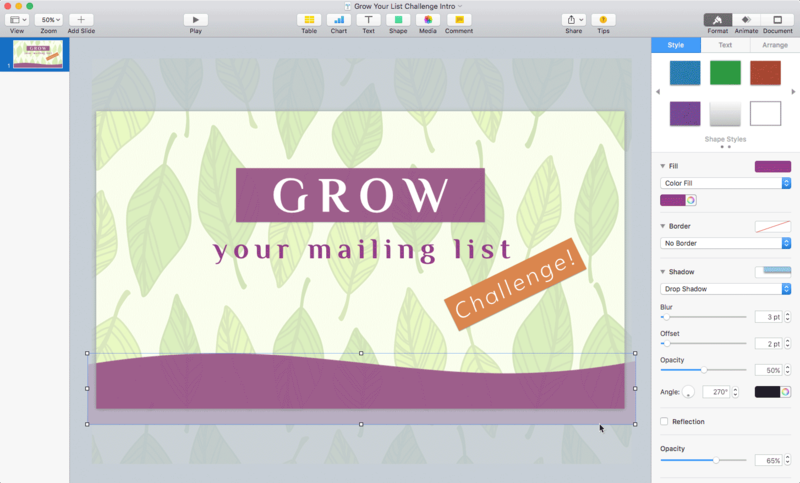 Let’s add a drop shadow to the orange box to match the drop shadow that Keynote added to the top purple box. In the Shadow section of the Style tab, change No Shadow to Drop Shadow. Leave the values for Blur, Offset, Opacity and Colour set to their defaults. Change the text to white. Head back over to the Text tab in the Format panel and click the coloured box to the left of the rainbow icon in the panel. Click the bottom-left white box to make the text white. Position and rotate the text box. Once you’ve styled your “Challenge!” text, use the mouse to position and rotate it. The last bit of content we need to add is the wavy purple shape along the bottom of the slide, containing the “Part 1…” text. Start drawing with the Pen. Click to add the first straight point of the wavy shape. Add the first curved point. Click and drag to add the first curved point. Add the second curved point. Click and drag again to add the second curved point. Add the right-hand straight point. Click to add the right-hand straight point. Add the other straight points, then click the very first point to close the shape. To style the shape, use the Copy Style and Paste Style menu options to copy the style from the purple rectangle. To finish, add the bottom white text on top of the wavy shape. Get it all movin’ and shakin’! Your Keynote slide is looking awesome! Now comes the really fun part, where you get to animate all those elements you added. Action builds (where you move an object around on the slide). For our intro, we’ll use only Build In effects. Click the background image to select it. You’ll see the little white resize handles appear around the image. Adding the Blur effect to the background image. Make the effect happen automatically. To make the Blur effect happen automatically, select the effect in the Build Order window and set Start to After Transition. Try it out! Click the Play button in the top toolbar (or choose Play > Play Slideshow). You should see your leafy background gradually fade in. Select the purple rectangle behind the word GROW. In the Build In panel on the right, click Add an Effect, and choose the Move In effect under the Appear & Move section. Click the Build Order button and, in the Build Order window, change Start from On Click to With Build 1. This makes the rectangle animation start at the same time as the background blur. Select the “GROW” text box. This time, add a Twist and Scale effect — it’s under the Flip, Spin & Scale section. Change the Duration from 2.5 seconds to 1 second, so it’s as quick as the rectangle animation. Again, click Build Order, and change Start from On Click to With Build 1. 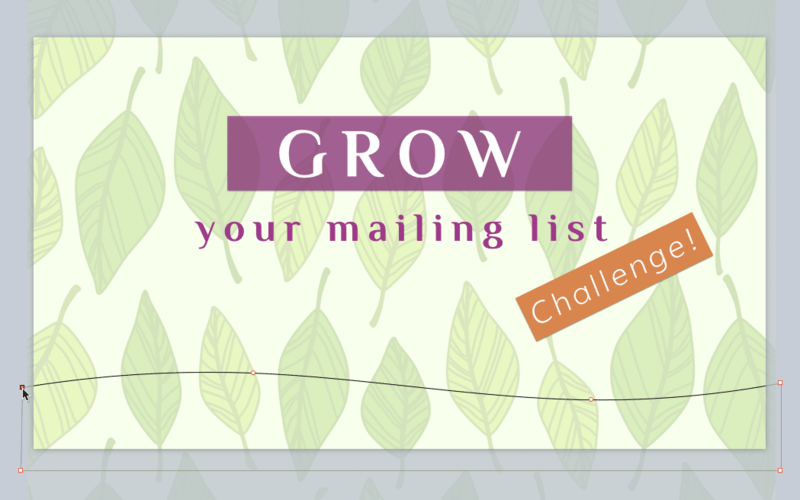 Animate the “your mailing list” text. Select the “your mailing list” text box. Add a Compress effect, under the Appear & Move section. Click Build Order, but this time change Start from On Click to After Build 3. This makes this animation happen after the “GROW” text animation has finished. Let’s make the “Challenge!” text stand out by adding a gorgeous sparkly effect! Select the text box, then add the Sparkle effect under Special Effects. Change the Duration to 1 second and, in the Build Order menu, change Start from On Click to After Build 4. We’ll fade the wavy shape into focus like we did with the background image. Click the shape to select it, then add the Blur effect under the Appear & Move section. In the Build Order window, change Start from On Click to After Build 5. Finally, let’s add a Trace effect to the bottom text to end with a nice flourish. 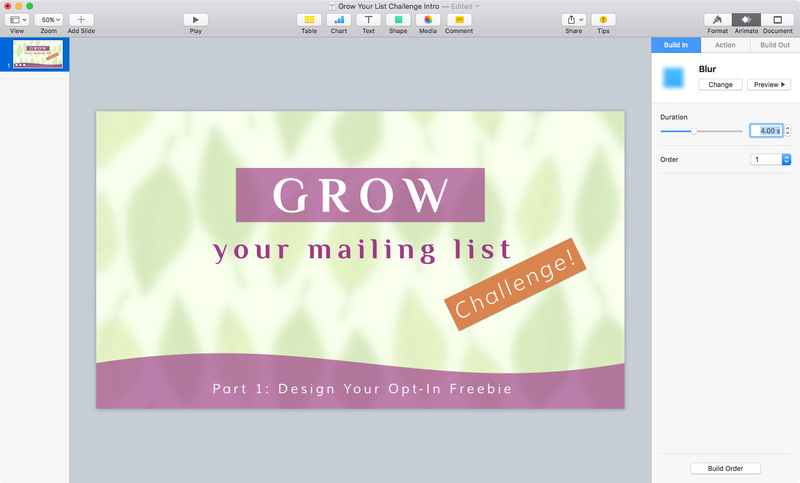 Select the “Part 1: Design Your Opt-In Freebie” text box, then add the Trace effect under Special Effects. In the Build Order window, change Start from On Click to With Build 6 to make it kick in at the same time as the curvy box blur effect. The finished Build Order window shows all of your animations in order. 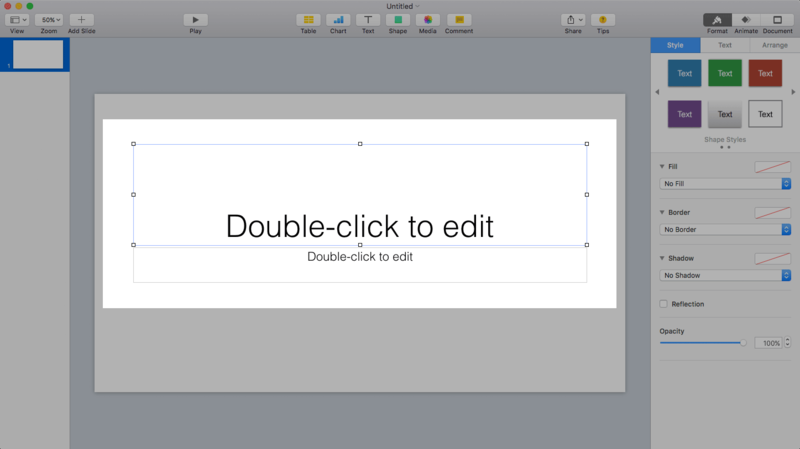 Click the Play button in Keynote’s top toolbar to see it in all its full-screen glory. 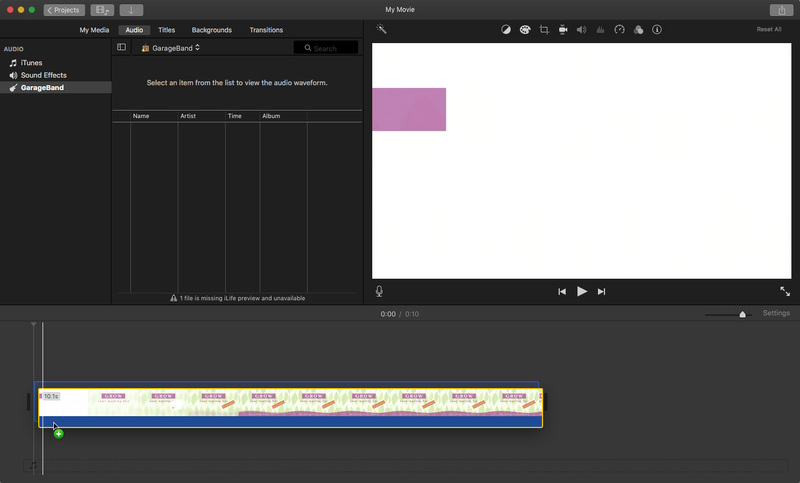 Now you’ve made your intro animation, you need to turn it into a movie file so you can drag it into iMovie. This step is super-easy! Choose File > Export To > QuickTime. Set Playback to Self-Playing, and set Format to 1080p. (You can ignore the other settings.) Click Next. Choose where to save your movie file, and click Export. Exporting the Keynote presentation to a QuickTime movie file. Wait a few seconds, and you’re done! 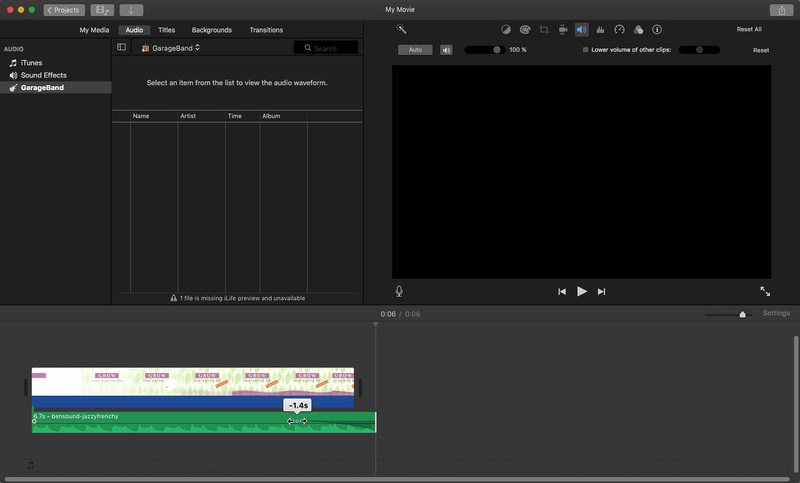 Open up iMovie and go to your Projects window (choose Window > Go to Projects). Now choose File > New Movie. 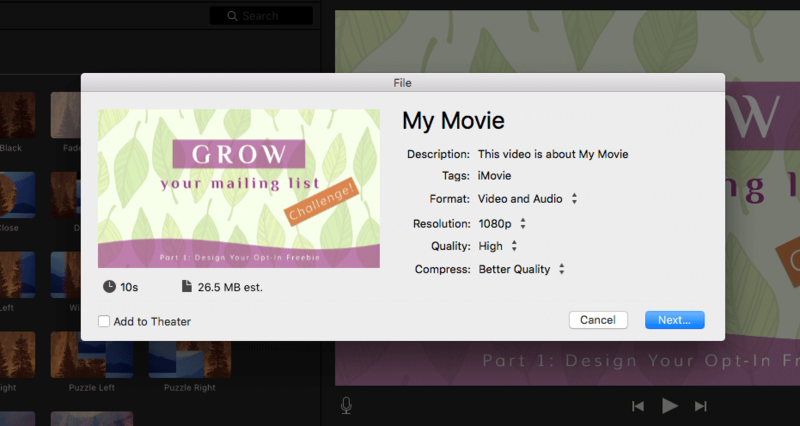 Drag your exported intro movie file into the iMovie timeline to add it to your movie. Drag your music file into the iMovie timeline. Shorten the music track by dragging its right edge to the left. You can shorten the intro video track in the same way, if you find it’s a bit too long for your needs. Fade out the music track by dragging the black and grey circle inside the track. That’s pretty much it! Now you can drag your actual video to the right of the intro in the timeline, and choose a transition (such as Cross Dissolve) to fade smoothly from the intro into your video. Don’t forget to include a credit for any music, sounds or graphics that you used in your video, if required. Exporting the finished movie from iMovie. Click Next to export your video to a movie file. 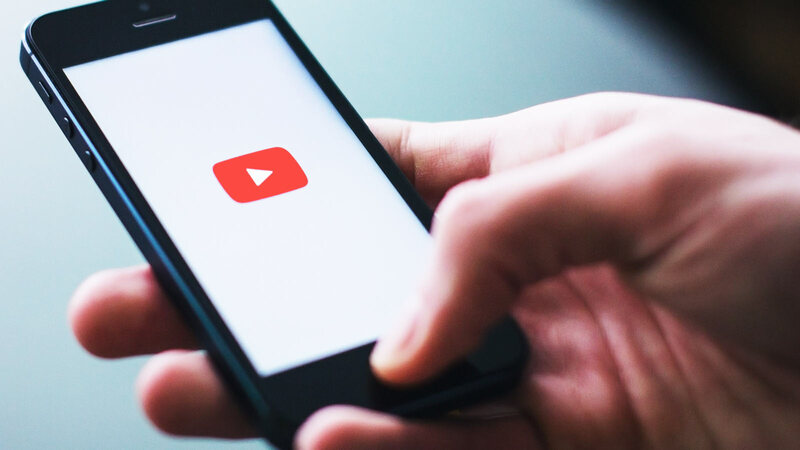 You can then upload your movie to YouTube, Vimeo, or social media, and embed it in your website. Good job! Grab the files and make your beautiful video intro today! As you’ve seen in this article, making gorgeous intros for your videos is really easy. All you need are Keynote and iMovie, some images and fonts, some catchy background music, and a little bit of time. To give yourself a head start with your intro, don’t forget to download the files used in this tutorial! You can easily take what you’ve learned here and adapt it to make your own unique intros for your videos. Try adding your business logo (and animating it using one of the Build In animations). 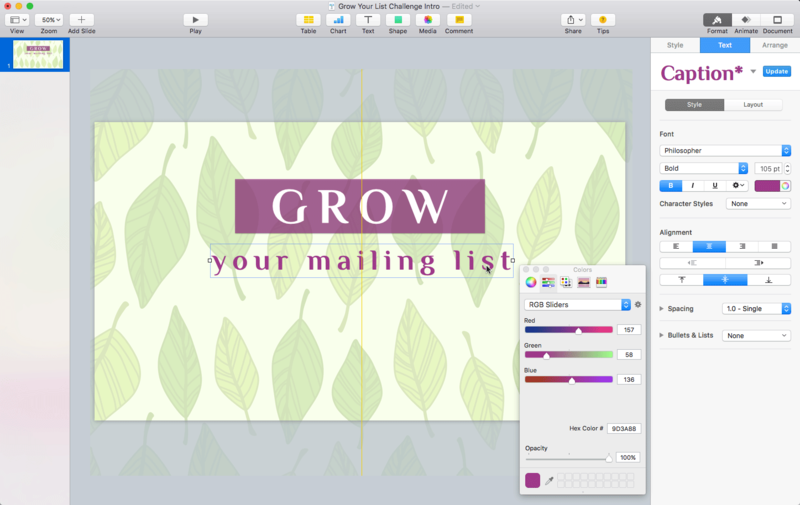 You can also experiment with different fonts, as well as adding and animating some icons and other clip art. So why not give it a go today? It’s a lot of fun, and you’ll have your very own video intro in no time! Your tutorial worked wonderfully, but I have a question about what to do after the final step that you describe. 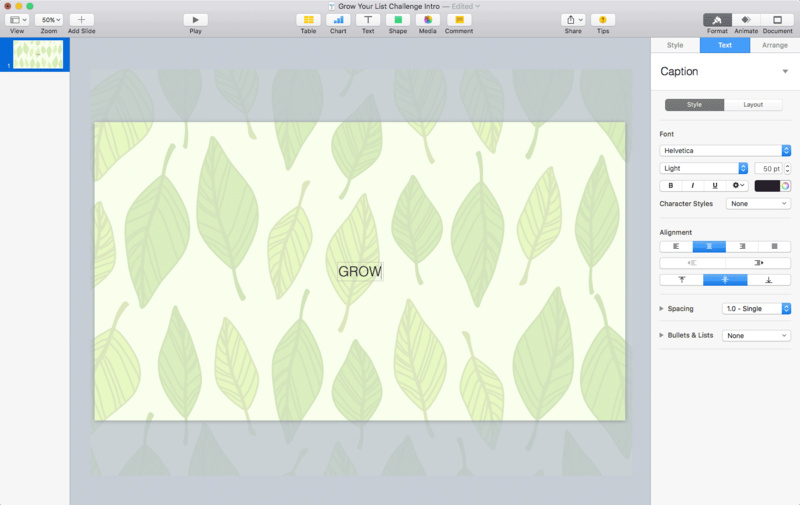 What if you want to add the intro to a Keynote slide presentation so that both run together seamlessly? 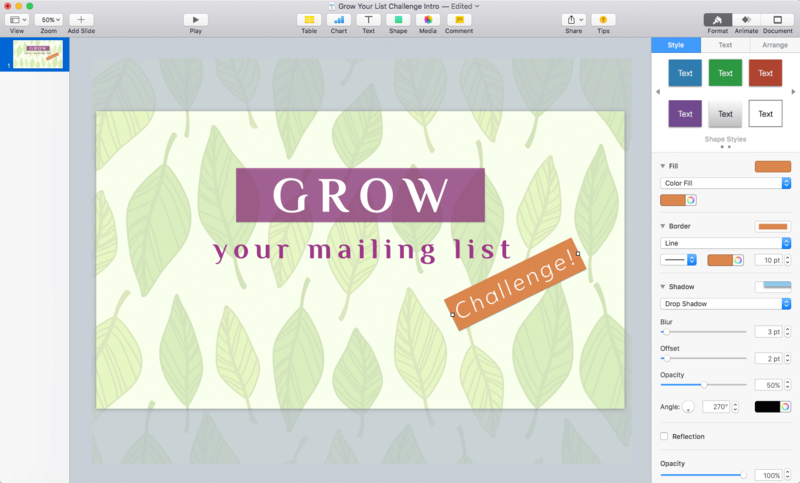 Do you create the slide presentation piecemeal on Keynote and then upload to iMovie and then add to the intro and then export the entire thing? 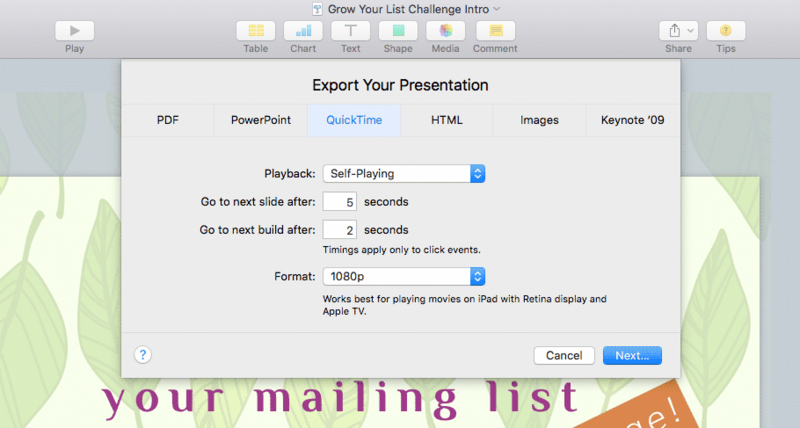 Or do you, instead, add the movie intro that you created to the keynote presentation? Also, Keynote allows you add audio files before exporting the whole thing to whole thing to Quicktime. 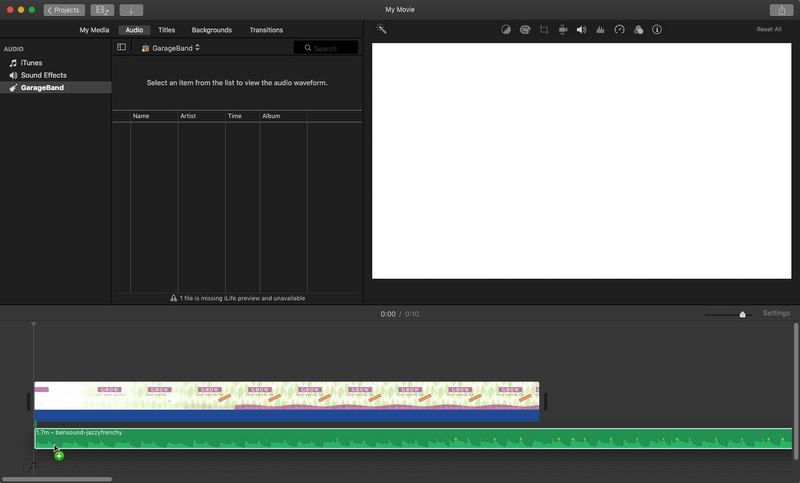 Why even use iMovie? Maybe the answer has something to do with the quality of the audio recording. I just tried doing what I described and the audio part sounds inferior, although visually it came out as good or even better than the one I created on iMovie. The iMovie file cropped the slides and removed some of the slide’s text. Thanks Oscar! I think it would be fine to join them together in either Keynote or iMovie. Of course if you’re making a movie using other software, or involving live action, then you’d want to bring everything into iMovie. 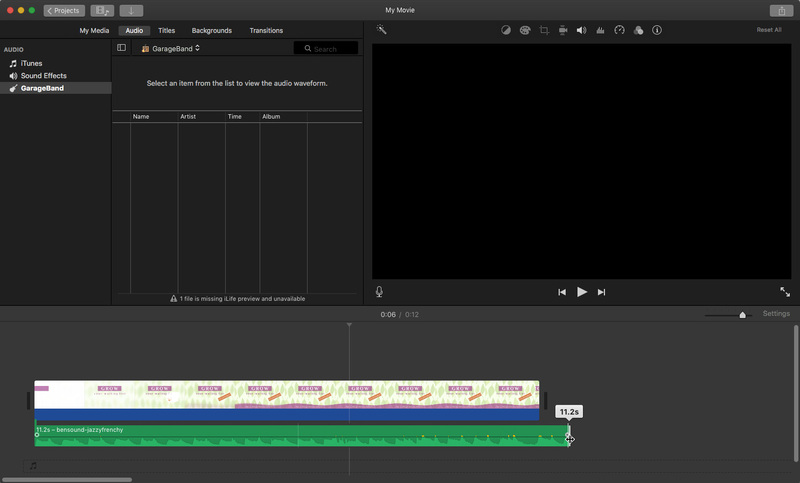 Personally I prefer editing in iMovie as it gives me more control. 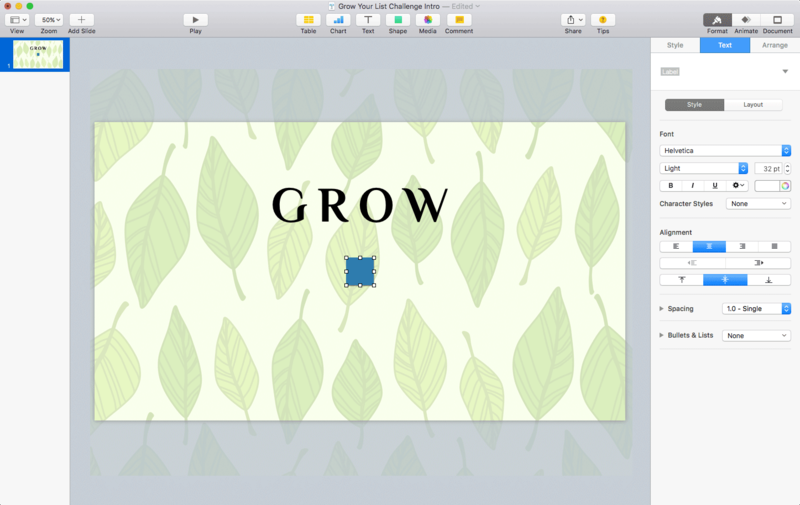 Regarding the iMovie cropping, make sure your Keynote presentation uses a 16:9 aspect ratio, and that iMovie isn’t cropping the frame (click the little ‘crop’ icon above the preview window in iMovie).